77-year-old Mugdin Guchetl, a witness for the prosecution in the extremist case against environmentalist Valery Brinikh, recanted from the testimony identified as his in the case file during a court hearing in Maykop City Court in Adygea, as reported by the international human rights group Agora, who cited Brinikh’s defense attorney Alexander Popkov. 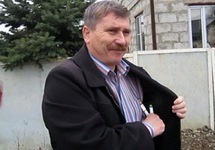 In testimony signed “Guchetl,” given during the investigation, it states that Brinikh has insulted not only the witness but the entire Adyghe people with his article “The Silence of the Lambs.” During the trial, however, the witness said he had not read the article, that he had not been in Adygeisk for around five years (although according to the interrogation report he was questioned in Adygeisk), that he had not given testimony to a police investigator, and that he had not signed the interrogation report. Presiding Judge Vitaly Galagan pressed Guchetl, telling him that if he did not acknowledge his own signature, he would be summoned to court again. The defense protested the judge’s actions and filed a motion for a handwriting analysis to be performed. The article “The Silence of the Lambs” was published on the website For Krasnodar! in September 2014. It recounts the environmental problems caused by Kievo-Zhuraki Agribusiness JSC, a large pig-breeding facility in Adygea’s Teuchezhsk District. The company was founded by Vyacheslav Derev, Karachay-Cherkessia’s representative in the Federation Council. On December 17, 2014, Maykop City Court ruled that “The Silence of the Lambs” was extremist. On March 20, 2015, the Adygea Supreme Court reaffirmed the lower court’s decision. In their rulings, the courts claimed the author of the article had insulted ethnic Adyghe, accusing them of cowardice. On January 12, 2016, Brinikh submitted a written petition to Maykop City Court asking it to reexamine its ruling in the light of new circumstances, but on January 21, Judge Irina Ramazanov refused to consider the petition. Defense attorney Popkov has noted that over the past year the Investigative Committee has ordered five forensic examinations in the case. However, the lawyer stressed that data from a wiretap of Brinikh’s telephone, conducted by the Federal Security Service (FSB) a few months before “The Silence of the Lambs” was published, has been subjected to a phonological forensic analysis. Hearing of the case on the merits began on January 26, 2016. Popkov had insisted on sending the case back to the prosecutor’s office, pointing out that a number of pieces of evidence had been falsified, but Judge Galagan rejected his appeal. During the February 9 hearing of the case, one of the ethnic Adyghes who was questioned refuted the charges against the defendant. Translated by the Russian Reader. Photo courtesy of 8772.ru. See my previous posts on Valery Brinikh and the case against him.